When little ones are very timid, it can take some time to form a friendship. Panda lives at Number 1 Bamboo Gardens, right next door to Pandora at Number 2. He longs to say, “Please come over and play!” but for some reason, whenever he sees her, he runs away instead. Next door, Pandora isn’t having much fun either. She can’t seesaw by herself, and throwing a ball to nobody makes her sad. Then, one winter’s day, it starts to snow. Panda rushes outside to make some snowballs, which he throws over the fence to Number 2. When Pandora doesn’t respond, Panda gets worried. What if she feels poorly or has gone away? In truth, she’s been inside the whole time, but she has the same worry about Panda. “Two very worried pandas / Wondered if they might / Be brave enough to go next door / And say, ‘Are you all right?’ ” They open their doors to check, colliding midway. An instant bond is formed. Together Panda and Pandora build a snowman, bounce up and down on the seesaw, dance on their ice skates and read storybooks. 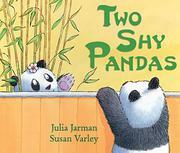 Best of all, they promise to be friends “[f]orever and ever.” Pandas make adorable stand-ins for little children, as Varley’s friendly watercolor illustrations attest.